We have a beautiful weekend in the forecast! Why not get out in the landscape and get a jump start on Spring Clean-up. This is a time honored tradition among gardeners, an excuse to get outside after the long winter months. A little extra time spent now, will save yourself from headaches further down the road. Here’s a check list to be sure your landscape is ready to go for the season. Be sure your pruners are clean and sharp! First things first, all your ornamental grasses and perennials will need a good haircut. Perennials can be cut to the ground but leave about 4-6″ of stem for the grasses. Shape or thin your shrubs. 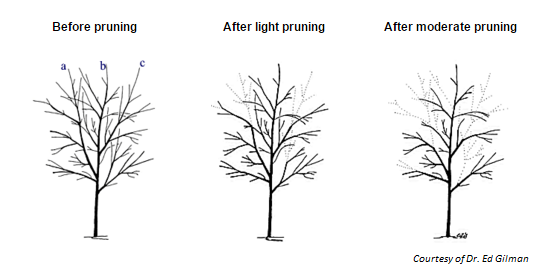 Assess the pruning needs of the larger trees on your property. Remember chainsaws are serious business! Leave major work up to the professionals and call the Certified Arborists over at Arbor Aesthetics. Now that all your plants are looking good, give those landscape beds a good raking and add the debris to your compost pile. Mulch is a natural alternative to river rock. It maintains soil moisture and temperature, minimizes weed growth and is natures intent – “Whenever in doubt, imitate nature“. It also helps create a defined and well maintained look to your landscape. 2″ of mulch is plenty – and be sure not to “mound” it around the base of trees and shrubs. “Volcano” mulching is OUT! Early Spring is a great time to get new trees planted before they leaf out. This is also a good time to divide and transplant any existing perennials or grasses that have become overgrown – Move to a new area of the landscape or share with a friend! This is a quick list for all the DIY-ers out there. If you want your landscape in tip-top shape but don’t have the time needed – give us a call!